Eloise Jelinek was a leading authority on syntactic and semantic theory, information structure, and several Native American languages (including Lummi, Yaqui, and Navajo). She was one of the very first generative linguists who brought the theoretical implications of the properties of typologically unusual and understudied languages to the forefront of mainstream generative thinking. 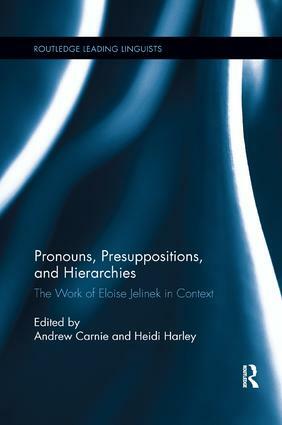 Jelinek originated the Pronominal Argument Hypothesis – the idea that many languages restrict realization of their arguments to pronouns. In other work, Jelinek investigated a broad range of morphological, syntactic and semantic phenomena in understudied and endangered languages. Besides the theoretical value of that work, it was instrumental in providing sophisticated semantic and syntactic documentation for such languages, where description is typically limited to the basic morphophonology and morphosyntax, as well as texts, that form the core of most descriptive work. Thirteen of her most important papers, together with a fourteenth essay previously unpublished, are here collected, each preceded by a short introduction that provides context for the work and evidence of its subsequent influence.